Raptor is a character who exists in the “MC2” continuity. This is a possible future for the Marvel Universe, 20-ish years in the future. 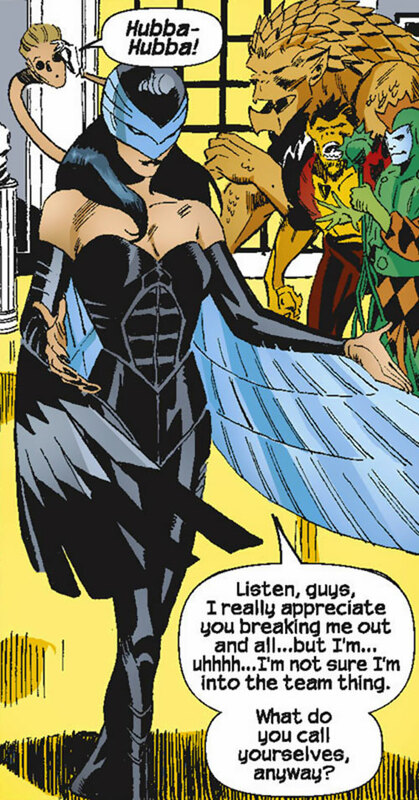 She is a legacy character, as she draws from two very early Spider-Man characters – Adrian Toomes and “Blackie” Drago. 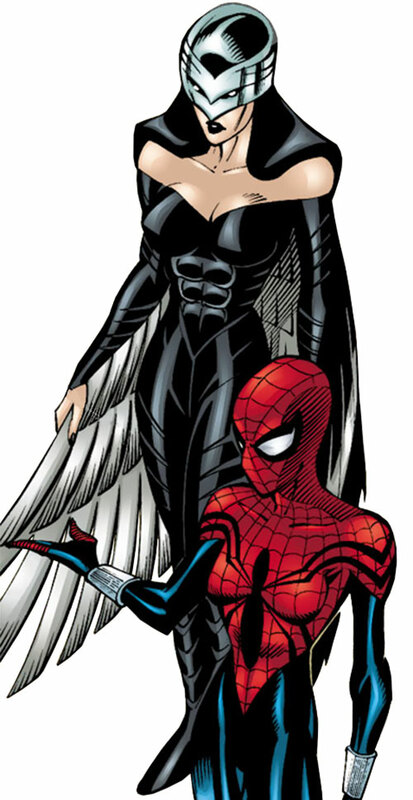 However, she’s a good guy, unless these sinister criminals who both used the Vulture identity. For more about the MC2 future, and more context in general, we suggest reading our Spider-Girl profile first. Real Name: Brenda Drago Osborn. Other Aliases: Sky Bandit, “Blackie”. Known Relatives: Raniero “Blackie” Drago (aka the Vulture, father), Norman “Normie” Osborn (husband), Franklin “Foggy” Nelson (father-in-law) and various Osborn and Nelson relatives by marriage. Group Affiliation: Former member of the Savage Six, member of the New Warriors (MC2 version), member of Agent Weadon’s team. Drago doesn’t have any particular skills, though she’s in excellent shape. She’s also skilled with her Raptor costume, albeit learning to master this technology is easy. With some training, it is possible to perform impressive aerial manoeuvres, and high-speed nap-of-earth flight even in a dense urban environment. The Raptor costume is closely based on Vulture technology. It has anti-gravity lift supporting winged flight and silent winged gliding, and a harness enhancing the wearer’s strength to peak human levels. This strength apparently disappears as soon as the harness is removed, which might make it safer than old Vulture tech. In fact it might just be a sort of flat exoskeleton . Between this strength and the wingspan, the wings can be used as buffeting weapons – or even to slice through light metals using the edge of the “feathers”. Hitting people with the wings is easy – they’re large and move fast. The Raptor suit is lightly armoured. This allows Drago to take multiple blows delivered with enhanced human strength without major damage or going unconscious. A good blow from a “Class 10” opponent might one-shot her, though. Brenda Drago is the daughter of brutal criminal and habitual liar “Blackie” Drago. 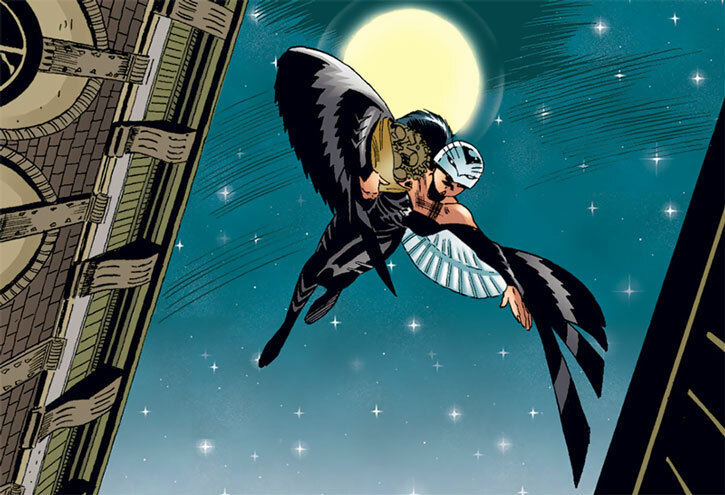 Blackie briefly became the second Vulture after stealing the technology developed by Adrian Toomes. Her mother was a dysfunctional alcoholic, and Brenda more or less had to raise herself. The kid spent times with unspecified relatives, but they kept her at arm’s length out of disapproval about her parents. Drago had a vague project to become the new Vulture, but no real way to do that. Brenda ended up in an abusive relationship with some dude called Tony, who had considerable technological skills. 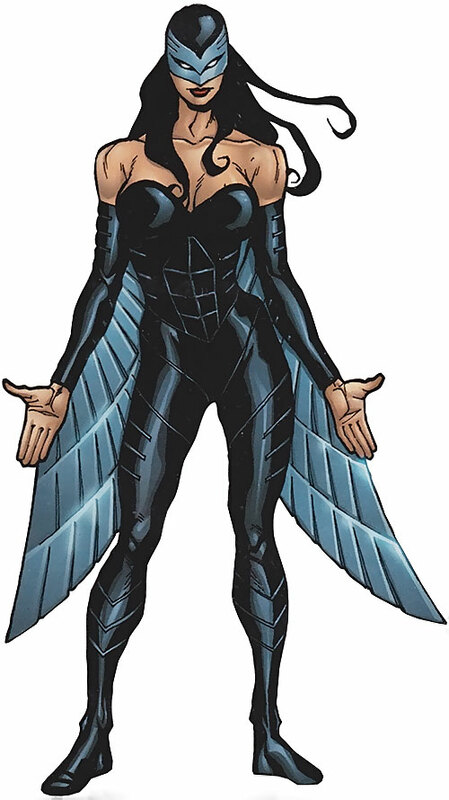 Between beatings (and of course insisting that it was her behaviour that forced him to hit her), he built a sleek winged costume based on Vulture technology. Brenda trained with it to become Raptor. Using underworld intelligence procured by Tony, Raptor specialised in swooping attacks to steal valuables packages from couriers. During an outing, she severely wounded one such man. Due to her speed early descriptions of her were hazy. Thus, to her exasperation the press dubbed her “the Sky Bandit”. There was also some confusion with the Buzz (Jack “JJ” Jameson), who had just made his own debut. 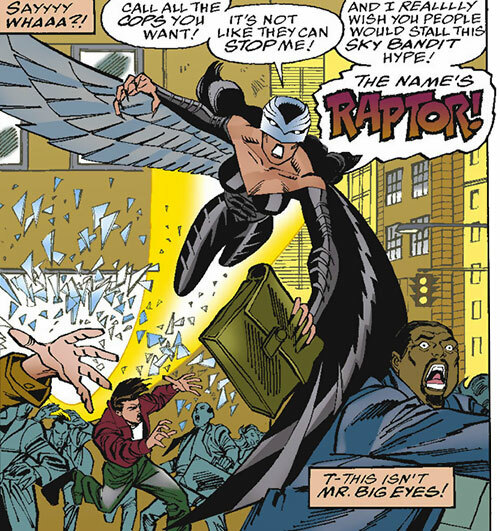 During one early theft, Raptor ran into Spider-Girl (May “Mayday” Parker). Drago promptly half-panicked, since she lacked the aggression to actually be a super-villain. However Tony yelled orders at her through her radio headset, and Spider-Girl had never fought a flying opponent before. Raptor thus beat Spider-Girl back, though she lost her loot. Upon her return to their HQ Tony hit her again and sent her to rob a jewelry store. But Raptor was outmanoeuvred and captured by Spider-Girl and the Buzz. The Buzz soon captured Tony as well. Some weeks later, Drago was freed from prison by operatives of Funny Face. He pressured her into joining his new villains team – the Savage Six. Funny Face sent Raptor to challenge Spider-Girl and start a gauntlet for her to run. But the red-and-blue bewebbed heroine easily defeated Brenda by restraining her arms to prevent her from beating her wings. Drago apparently escaped before the police could arrest her. But meanwhile, Tony lied to the DA and blamed Brenda for their entire crime wave, gaining early release. At this point, Brenda didn’t want to be a criminal anymore. She felt guilt about her past actions and the courier whom she had crippled. She resorted to stealing groceries – both to feed herself, and to leave as gifts for the impoverished ex-courier. Spider-Girl intercepted her, but Raptor wrecked Parker’s goblin glider and fled. About a week later, Raptor spontaneously came to help the Buzz and Spider-Girl escape from the Avengers. Spider-Girl seized the occasion to convince her to rehabilitate. Parker’s close friend Normie Osborn retained legal representation for Drago – namely Reilly Tyne (secretly Darkdevil). While Tyne negotiated her surrender Drago remained in hiding, and developed romantic ties with Osborn. Meanwhile, Tony agreed to upgrade the equipment of the villainous Mister Nobody, and asked as payment that he harass Drago and kill Tyne. However, the hit was foiled by multiple super-heroes. Raptor joined the New Warriors assembled by Spider-Girl – along with the Buzz, the Green Goblin (Phil Urich) and Ladyhawk (Ms. Morgan). This team stopped the rampage of Angel Face and Funny Face through New York City’s underworld, but expelled Spider-Girl after she made a deal with the Faces. 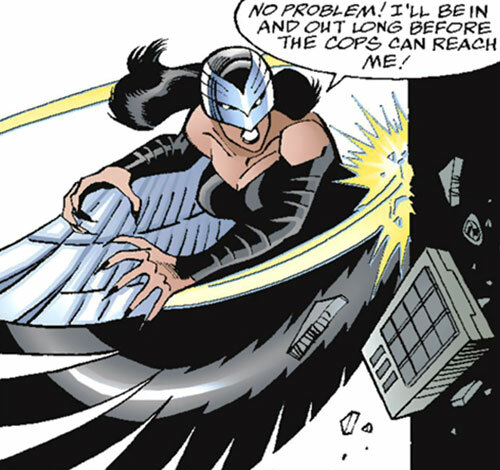 Raptor continued to operate with the Warriors while avoiding the police. Reilly Tyne brokered preliminary terms for Raptor’s surrender. But jail time was a certainty, which horrified Drago. Normie Osborn — by then her boyfriend — persuaded her to face the ordeal, and she went to prison. However, the government’s hidden goal was to have Raptor serve with a secret team made up of convicts, à la Amanda Waller. Drago was immediately strongarmed into joining the team monitored by Agent Weadon and commanded by Kaine. The other members were Big Man and Quickwire. This team operated in the shadows, giving Spider-Girl the impression that Brenda had escaped and joined super-villains. After Normie was shot and only barely survived, Spider-Girl found and attacked Raptor, thinking that she had betrayed him. 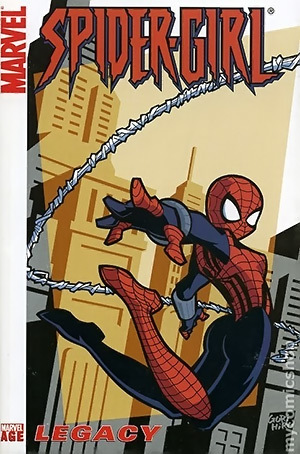 But the situation was cleared when Weadon revealed the existence of his team to Spider-Girl. Spider-Girl discovered that Normie had actually been shot by Mister Nobody, and to Brenda’s relief she captured the gunman. Though Weadon had refused contacts between Drago and Osborn, he eventually relaxed his stance and Brenda made regular visits to the hospital. Weadon’s team was later trounced by Tarantula (Fabian LaMuerto), who broke Raptor’s left arm. As she recovered she discussed marriage with Normie. Osborn was then kidnapped by Fury the Goblin Queen. Spider-Girl and Raptor came to the rescue, and after the fracas Brenda and Normie became engaged. The engagement ceremony was raided by Fury, who bound Normie to the Venom symbiote . While a rescue effort including Raptor was being prepared, Spider-Girl went out and defeated Venom. Osborn then made a deal with the symbiote – discreetly wearing it and gaining far greater confidence and assertiveness. As a result he decided to finally take his place as the head of Oscorp to have enough money to marry Drago. He also started calling himself Norman rather than “Normie”. Norman had new Green Goblin technology built for Phil Urich. He also used the symbiote to foil a few crimes against Oscorp. As a result Agent Weadon came to suspect that he was up to no good, and ordered Drago to spy on him. She refused, but Osborn soon revealed to her that he occasionally was active as a symbiote-bound superhuman. He also admitted that he couldn’t decide on a name. A misunderstanding resulted in an assault by “Jim”, a Stark Industries enforcer, against Osborn. Raptor helped the Avengers attempt to stop “Jim”, but was knocked out. Osborn took “Jim” out, and told the Avengers that he was in Raptor’s custody. He then made an offer to Weadon to join his team… in exchange for a pardon for Brenda, which would also allow her to leave Weadon’s team. The deal was hammered out, and Norman and Brenda planned their marriage. However, the Scriers cult launched an onslaught against Spider-Girl. As a part of this, they hired the deadly Hobgoblin (Roderick Kingsley) to get rid of her allies to clear the field. Raptor was among Kingsley’s targets, and was beaten nearly to death. Spider-Girl and Norman rushed Brenda to the hospital, where the doctors did a remarkable job fixing her injuries. Brenda agreed with Norman to retire her Raptor identity, as she was manifestly ill-suited to superhuman combat. Hours later the symbiote sacrificed herself to save Spider-Girl and defeat the Hobgoblin, but Norman escaped from the Scriers. Osborn and Drago were married right in Brenda’s hospital room. Years later, when Fury the Goblin Queen returned, Raptor broke her suit out of storage and joined Kaine, Urich and Darkdevil to help Spider-Girl and her father. Raptor stumbled upon the Goblin God (Norman Osborn), but dodged him long enough for reinforcements to come in. The Goblin God was destroyed from within by Spider-Man (Peter Parker), Spider-Girl (May Parker) and Mayhem (April Parker). With the crisis adverted and Norman safe from kidnapping by the Goblin Cult, Brenda once again mothballed her Raptor identity. Drago is a scrumptious young lady. Flowing silky black hair, fine features, smooth skin with a light tan, unusually slim and well-proportioned body, etc.. She’d look good in Crocs and a track suit. Her Raptor costume is pretty cool-looking, too. Brenda prefers to dress in solid, featureless but flatteringly fitted black — not unlike her Raptor costume — and likes leather. As Raptor her hands sometimes seem clawed. It is likely that she occasionally wears cosmetic claw-themed nail extensions as part of her costume. Brenda is aimless. Having had essentially no parents, she has no clear idea of what she should do with her life. She’s also both wary of people around her, and eager to find somebody who can provide her with a sense of direction. Drago generally means well, at least since she’d discovered she has too much empathy for crime. However she lacks willpower, and needs a supportive and protective environment so she can reinvent her life. However she doesn’t lack physical courage – she does a decent job operating as a minor super-heroine, especially if she’s part of a team or duo. Raptor lacks aggression. She can become dangerously angry during a fight and strike to kill, but when that happens she lacks the focus to be an effective killer. Once Brenda and Normie determined — with Spider Girl’s help — that their relationship was serious, Brenda wanted to rush toward engagement and marriage. That was because she had become afraid of being separated from Normie. She also developed a profound enmity toward Fury the Goblin Queen, who has been promised in marriage to Normie as a child? Generally, Brenda is likely to lash out at anything that might drive Normie away from her. Raptor considers that Spider-Girl is one of her best friends, but doesn’t know about her secret identity. MIH of Fury the Goblin Queen, Dependent (Norman Osborn, worth 0 points due to reciprocity and similar power level). For a while, Raptor had Mistrust. RAPTOR SUIT [/STR/ 05 /BODY/ 05 BODY 06, Claws: 06, Flight (Winged): 06, Radio communications: 06, Thief (Stealth): 05, Limitation: Thief limited to silent gliding]. – Acrobatic flying — Enhanced Dodge 4, Move-by-attack, Evasion (all are Limited – only while in flight). – Exoskeleton (presumably) — Enhanced Strength 4, Enhanced Stamina 4. – Flight — Flight 5 (Winged, Subtle 2). – Using wings as a weapon — Enhanced Fighting 3, Strength-based Damage 1 (extra descriptor – can be Blunt or Slashing). – Radio — Radio Communication 3. Close attack 2, Evasion, Move-by Attack. Attractive, Benefit 1 (married to Norman Osborn). Athletics 1 (+1, +5 w/suit), Close combat (Raptor suit wings) 5 (+11), Expertise (Smalltime criminal) 2 (+2), Insight 1 (+1), Perception 2 (+2). Lost but not stranded Brenda is aimless and lacks willpower, though she’s trying to do the right thing. 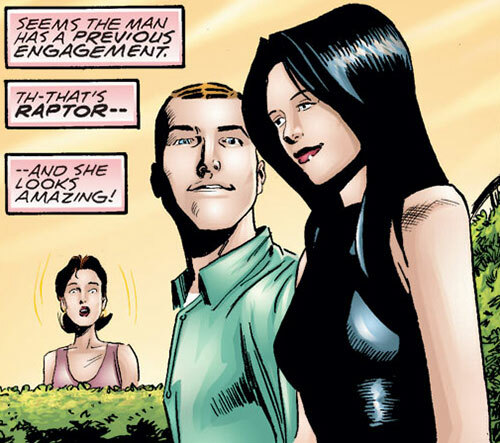 Relationships Drago loves her husband Norman “Normie” Osborn, and considers Spider-Girl (May “Mayday” Parker) to be one of her best friends. Hatred Brenda will overreact to anything that might take Norman away from her – particularly Fury the Goblin Queen. Trade-off areas Attack/Effect PL 8, Dodge/Toughness PL 6, Parry/Toughness PL 6, Fort/Will PL 4. Point total 65 Abilities 10, Defences 7, Skills 6, Powers 3, Devices 35, Advantages 4. Equiv. PL 5. Brenda is best treated as PL5, given how the build works. Her wings can be surprisingly dangerous, but that’s about all she’s got going for her. Writeup completed on the 28th of May, 2014.